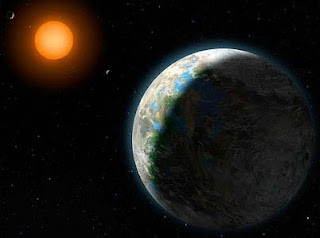 eNLokam: Kepler-22 b New earth-like planet discovered! Earth is brimming with people, aroud 7 million! Population explosion is becoming a big problems. Space and resources have been diminishing. Don’t worry, a new earth is located! Hey, don’t make haste; it is only a ‘habitable’ earth-like planet, which is orbiting around a sun-like star some 600 light years away. The planet, called Kepler-22b, joins a list of more than 500 planets found to orbit stars beyond our solar system. The discovery has been made by a team of researchers from NASA’s Kepler Mission. This is a large, rocky planet with a surface temperature of about 72 degrees Fahrenheit, which is so good climate as per our parameters! The discovery team, led by William Borucki of the NASA Ames Research Center, used photometric data from the NASA Kepler space telescope. The host star lies toward the constellations of Lyra and Cygnus. The star, a G5 star, has a mass and a radius only slightly smaller than that of our Sun, a G2 star. As a result, the host star is about 25 percent less luminous than the Sun. The planet orbits the G5 star with an orbital period of 290 days, compared to 365 days for the Earth, at a distance about 15 percent closer to its star than the Earth from the Sun. This results in the planet’s moderate temperature. It orbits in the middle of the star’s habitable zone, where liquid water is expected to be able to exist on the surface of the planet. As we all know liquid water is necessary for life, and this new planet might well be not only habitable, perhaps even inhabited! This new exoplanet is the smallest-radius planet discovered in the habitable zone of any star to date. It is about 2.4 times larger than that of the Earth, putting it in the class of exoplanets known as super-Earths. The study will be published in the Astrophysical Journal.